This year marks the 50th anniversary of the Freedom Riders’ attempts at integration of transportation and amenities across the south. The arrival of the Freedom Riders in May, 1961 was met with mob violence and police brutality, but it did not end segregation in Mississippi. The Freedom Riders did, however, pique public awareness across the nation of the inequalities in the south and the need to address them. In 1962, representatives of four civil rights organizations — SNCC (Student Non-violent Coordinating Committee), CORE (Congress of Racial Equality), NAACP and SCLC (Southern Christian Leadership Conference) — met at Clarksdale and formed a new organization designed to coordinate their efforts and resources in Mississippi. They called the organization COFO (Congress of Federated Organizations). The primary concern was to register black voters in Mississippi. At the time, Mississippi at less than 7% had the lowest percentage of black voter registration in the nation. Blacks seeking to register to vote were subjected to poll taxes, examinations that they had to pass to become enfranchised, and, when that was not enough, violence and even death. 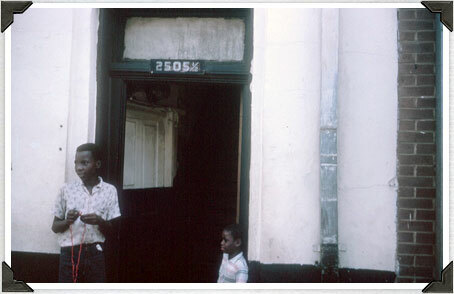 In January, 1964, Michael Schwerner came to Mississippi and opened a COFO office in Meridian at 2505 1/2 Fifth Street. Schwerner was a member of CORE, and was a native of New York. He and his wife, Rita, lived in a Meridian apartment, and engaged in various community organizing activities. The COFO office was the headquarters of the Freedom Summer operation in Lauderdale County. 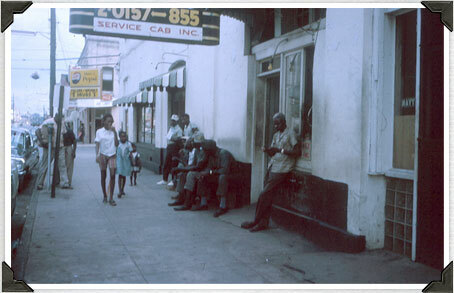 The headquarters occupied the second floor of the Fielder & Brooks Drug Store, an established and respected black business. The Schwerners opened a COFO-sponsored community center where black children could gather and play games, socialize and access a lending library. COFO in Meridian also operated one of the several dozen Freedom Schools that were opened across Mississippi that summer. The Freedom Schools taught citizenship, black history, constitutional rights, political processes, and basic academics. More than 3,500 students attended the Freedom Schools. Meridian’s Freedom School was at the old black Baptist Seminary. Meridian is a city of 50,000, the second largest in the state. It is the seat of Lauderdale county. It is in the eastern part of the state, near the Alabama border, and has a history of moderation on the racial issue. At the present time, the only Republican in the State Legislature is from Meridian. Registration is as easy as anywhere in the state, and there is an informal (and inactive) “biracial committee”, which, if it qualifies, is the only one in the state. Voter registration work in Meridian began in the summer of 1963 (for COFO staff people, that is), and by autumn, when Aaron Henry ran in the Freedom Vote for Governor campaign, there was a permanent staff of two people in the city. In January, 1964, Mike and Rita Schwerner, a married couple from New York City, started a community center. In Meridian’s mild political climate, the community center there has functioned more smoothly than either of the two community centers which COFO has organized in tougher areas. The center has recreation programs for children and teenagers, a sewing class and citizenship classes. It also has a library of slightly over 10,000 volumes, and ambitious plans for expansion if more staff were available. The COFO staff in Meridian uses Meridian as a base for working six other adjoining counties. The Freedom School planned for Meridian will have a fairly large facility, in contrast to most places in the state. The Baptist Seminary is a large, 3-story building with classroom capacity for 100 students and sleeping accommodations for staff up to about 20. Besides this, there is a ballpark available for recreation. The school has running water, blackboards and a telephone. The center has a movie projector and screen which it probably would lend. The library lends books to anyone for two-week periods. The question of rent has not been decided for the school. Even if there is no rent, however, we can count on a budget of around $1300, for food for students, utilities, telephone and supplies. One of the COFO volunteers was Mark Levy, who came to Meridian with his wife, Betty, from Queens College in New York. He chronicled his sojourn in Meridian with his camera, and his impressive collection of photographs is in the Queens College archives, where you can view it online. 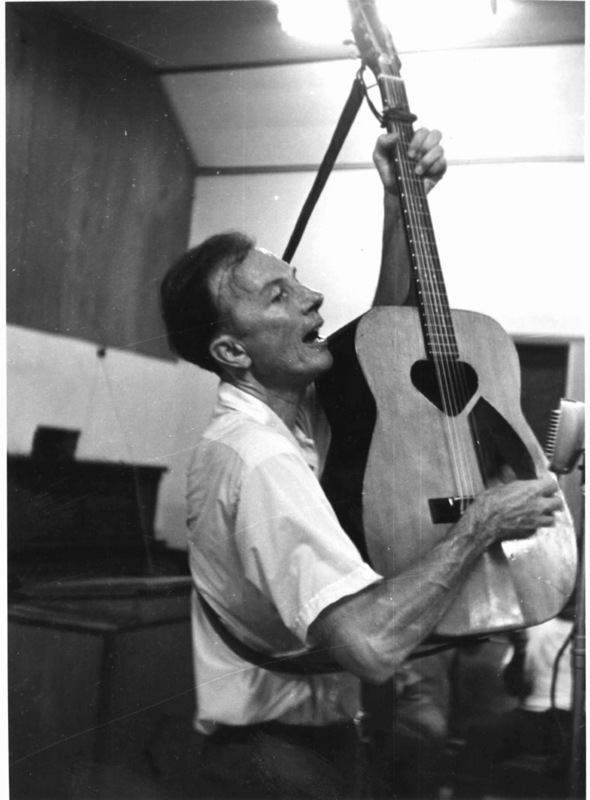 A remarkable fact documented by Levy is that the famed folk/protest singer Pete Seeger visited Meridian and played at the old Mt. 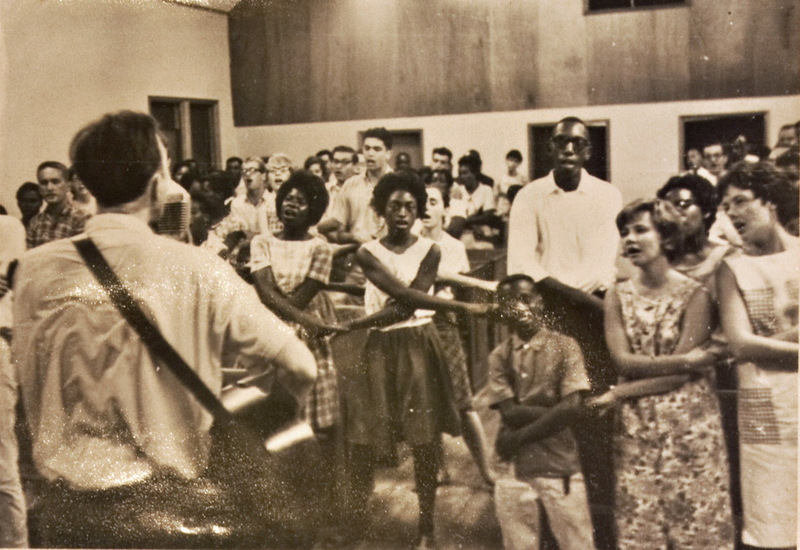 Olive Baptist Church during Freedom Summer. He performed for the COFO volunteers. The next photo shows COFO workers and others joining hands to sing along with Seeger. The young woman at the right with the flowered dress is COFO volunteer Patti Miller of Iowa, who pinpoints the date of Seeger’s performance as August 4, 1964. Shortly after he arrived, Schwerner was joined by an eager young Meridianite volunteer named James Chaney. 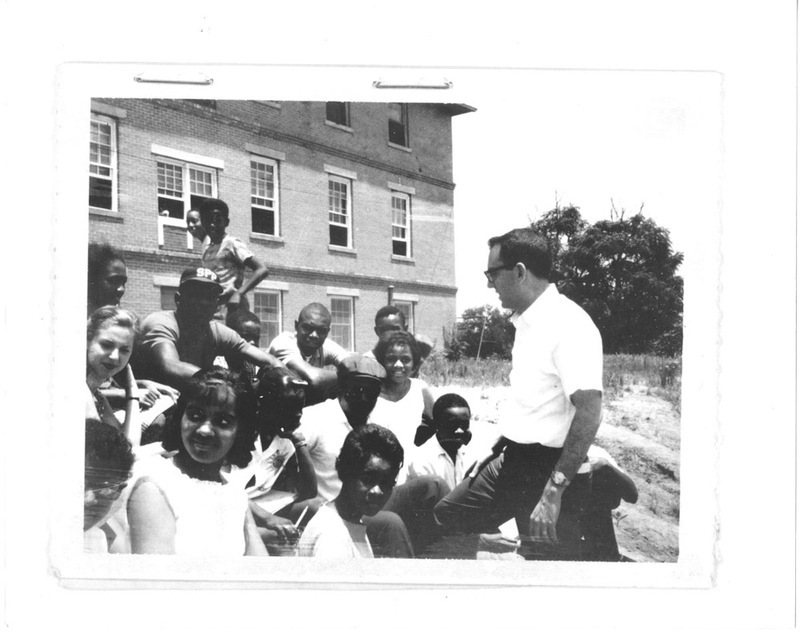 As the summer drew near, other volunteers began to arrive from other places, among them Andrew Goodman of New York. Despite its moderate reputation on racial issues, there was a dark underside to Meridian and the surrounding area. The Klan was active, with members in law enforcement and in influential positions. 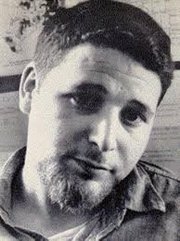 The Klan had its eye on COFO, and on Schwerner in particular. They gave him the derisive nickname “Goatee,” for his beatnik-style beard, and spread rumors that he was having an affair with a black woman. Mississippi’s political leadership provoked the citizenry with accusations that the COFO workers were communists who had trained in Cuba. FBI Director J. Edgar Hoover made the statement that “We will not wet-nurse troublemakers,” insinuating that anyone who took matters into their own hands would not be bothered by the feds. On June 21, 1964, Schwerner, Goodman and Chaney had returned from a training session in Oxford, Ohio, to learn that the Mt. Zion Methodist Church in Neshoba County had been burned by the Klan and some of its members beaten in retribution for allowing a Freedom School to operate there. The three travelled from Meridian to Neshoba and met with the leaders of the church. As they made their way back to Meridian, the three were stopped by a Neshoba County Deputy Sheriff and taken into custody on the pretext of a speeding charge. After they were released from jail in Philadelphia, they were stopped again on Highway 19 South by the Sheriff, who allowed a group of Klansmen to take them to Rock Cut Road, between House and Bethsaida, where all three were murdered by gunfire. An historical marker is set on the junction of Highway 19 and the road where they were killed. When the trio did not return to Meridian as scheduled, their disappearance was reported and a manhunt ensued. Hundreds of naval personnel participated. President Johnson ordered Hoover to mobilize the FBI, and the agency began investigating, increasing the number of agents in the state from 15 to more than 150. Posters went up. 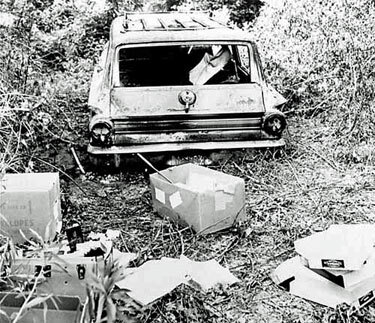 Before long, the searches turned up the CORE station wagon that the men had driven from Meridian. It had been taken to the Pearl River swamps north of Philadelphia east of Stallo off of Highway 21, where it was burned. 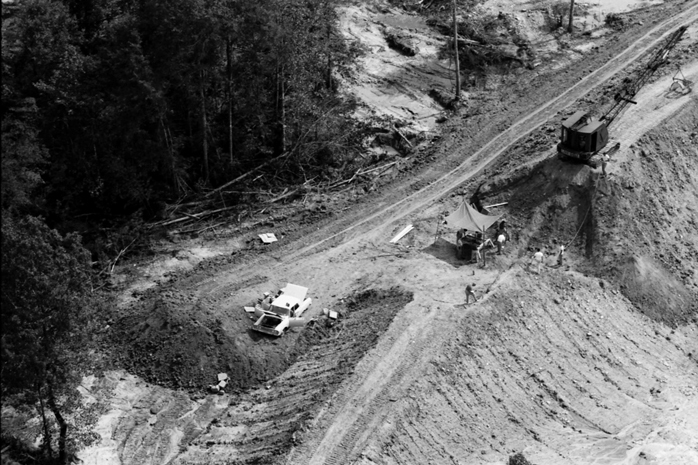 The discovery of the car did not quell the public belief that the disappearance had been staged, but the denial, speculation and ridicule abruptly ended when the three bodies were discovered by the FBI in a dam being built not far from the Neshoba County fairgrounds. It was conclusive proof of the atrocity. The FBI autopsy revealed that all three young men had died of gunshot wounds. 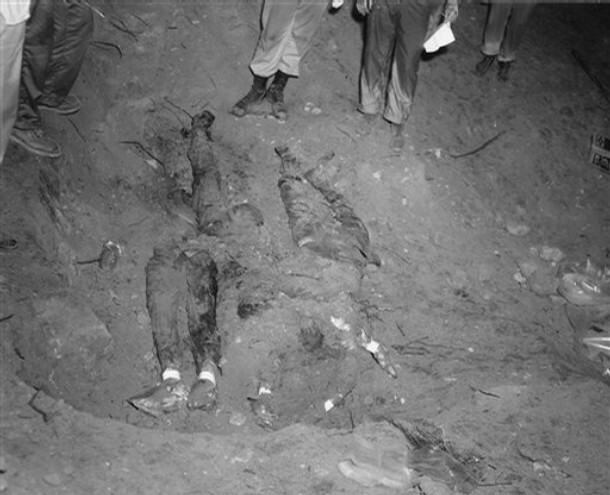 The families were not convinced, however, and they demanded and got a second autopsy which revealed that Schwerner and Goodman had indeed been shot and killed. Chaney, though, had been brutally beaten before being fatally shot. The doctor who performed the autopsy said that he had never seen such extensive, catastrophic injuries, including smashed bones and damaged internal organs, not even in car or plane wreck victims. Patti Miller remembers that that the bodies were found on August 4, 1964. She remembers that date because it was Seeger himself who announced it that night to the COFO workers during his appearance at Mt Olive. Nineteen men, many of whom were from Meridian, were arrested and charged with the killings, but state charges were soon dropped. The federal government prosecuted them for violation of Schwerner’s, Goodman’s and Chaney’s civil rights, and seven were sentenced to varying terms up to ten years. It took until 2005 for one of the defendants, Edgar Ray Killen, to be brought to justice in a Mississippi court. He was convicted of manslaughter in Neshoba County Circuit Court. Long before the legal proceedings, though, the families had to bury the dead as a prologue to getting on with their shattered lives. 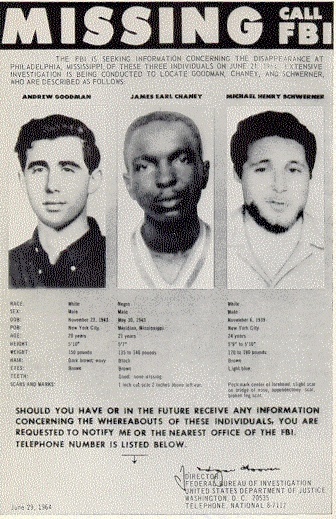 Schwerner and Goodman were taken back to their homes far away in New York. Chaney’s funeral was held in Meridian. Mourners included his collegues, the COFO workers. The funeral services took place at four different churches, culminating at First Union Baptist Church on 36th Avenue. As for Freedom Summer, the results were mixed. Some voter registration was accomplished in the face of resistance. People were beaten and killed. Churches were burned. Violence across Mississippi escalated. By any of those measures, it was at least a borderline failure. But the deaths of Schwerner, Goodman and Chaney galvanized public opinion. The 1,000 or so COFO workers returned home from Mississippi with eyewitness testimony about the severity of the situation, many of them with scars to corroborate their stories. The nation realized that the full weight of the law and the federal government would be needed to end the systemic injustice that fostered violence and hatred and shielded murderers. The political pressure became irresistable, and the 1964 Civil Rights Act passed Congress and was promptly signed into law by President Johnson. Freedom Summer was not the end of apartheid in Mississippi, but it did help deal it a mortal blow. Thanks to Dr. Bill Scaggs for the info about Pete Seeger, Mark Levy and the Freedom School. 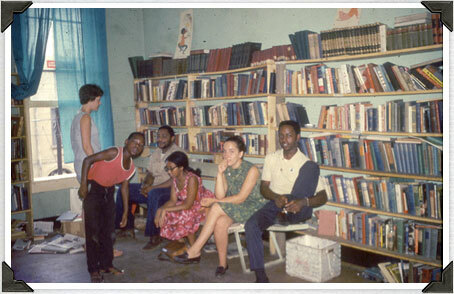 Patti Miller, the COFO volunteer mentioned above, has a Keeping History Alive site where I found several Freedom School photos. It was great seeing Mark, Gail, Patti, Joe, Sue Brown, the lovely Thompson girls, George Smith’s widow, and many others during the 50th anniversary of Freedom Summer. It took me back to the day of meeting Mickey, Rita and James before Freedom Summer, it caused me to think of the times of meeting Medgar Evers in 1963 and Dr King in 1966. Remembering Freeman Cocroft, Sam Brown, Eric Weinberger, Bozella, Luke Kabot, Betty Manuel, Frank and Judy Wright, Ruth, Big G, Big G’s mother, Mrs. A Smith, Ms Heidleberg, Ms Whitlock, my mother and other young brave black women, Mr.A.C., later Rev Killingswoth and Freedom’s Chidren alias the COFO KIDS: my sisters Lois, Linda, Lenora, my brothers, Larry & Larry, the Sims, Wallace, Gaddis, Chaney, Henderson, Griggs, , others, We, the people were much closer in those days, families took care of one another. We children were not afraid, we wanted to be part of something special and good! We knew then that God was on our side!!! I am still almost in shock as I’ve read this historic story some 2-3 times over. You see, I had just turned 10 years old that summer in Meridian, Ms when the Freedom Riders came to Meridian! Many photos were taken of us(5 of my 9 siblings) by Mark Levy and Donna Garde. I can barely believe that we, “Freedom’s Children”, (as author Ellen Levine called us in her book) would play such an important role in this massive chapter in American History! These were some of the worst times for the poor, Black children in the south. We were witnesses to such horrible crimes against Black humans and the White human beings who came to assist us! 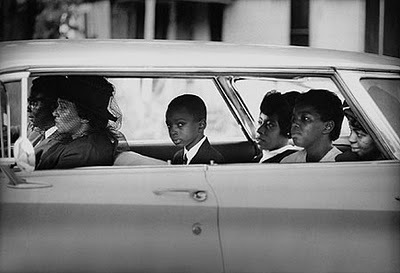 God Bless those Freedom Riders who made such a difference in the lives of so many children in the Southern states!! Thank you for your testimony, Gwen. I don’t know where you are now, but I hope if you return to Meridian you will see major change. Things are not perfect, but they are much improved. Thank you for taking time to comment. The darkest time in our state’s history, at least in my lifetime. One would hope that we have learned acceptance of all people, but I fear that may never happen. Judge, we were just boys when these events occured, yet I remember them vividly due to the reactions of my parents and adults around me. My father was “visited” by the Klan because he had the audacity to have an integrated waiting room for his eye clinic patients, instead of the segregated rooms that society mandated. The Freedom Volunteers were brave young people who dared to believe that Mississippi could be better… Thank God, we’ve learned that their hope was well founded. Blacks were not the only victims of racism. We were enslaved by it and injured by it, too. Our wounds, however, were self-inflicted. You are currently reading FREEDOM SUMMER IN MERIDIAN at The Better Chancery Practice Blog.